1984 The all new 1984 Mustang SVO came with an air-to-air intercooled, turbocharged, 175hp (at 4400rpm), 2.3 liter, electronic fuel injected, inline 4-cylinder. The Ford Special Vehicle Operations (SVO) group was started on the 1980 Mustangs to to help interested race car drivers build up competition versions of the Mustang, create a kits of bolt-on parts that could be purchased by average Mustang owners to modify their street cars, and create a series of specialty GT racing cars. The 1984 SVO Mustang was the first car to do the later. 1985 The SVO Turbo Mustang started the 1985 model year with the previous year's air-to-air intercooled, turbocharged, 175hp (at 4400rpm), 2.3 liter, electronic fuel injected, inline 4-cylinder. Mid year this changed to a 205hp version by incorporating some of the GT improvements as well as reworked turbo elements. The 1985 SVO continued to have the charcoal front and rear bumper moldings, double split rear spoiler, single hole grille, and single offset integrated hood scoop. Some of the new changes to the 1985 GT made it look more like the SVO. 1986 The 1986 Mustang SVO came with the later 1985 model year 2.3L turbo 4-cylinder engine rated at 200hp. The exterior style remained the same with the offset hood scoop, hood design that extended into the grille area, 10 slot wheel covers, color-keyed bodyside molding with charcoal front and rear bumper molding, and double rear spoiler. 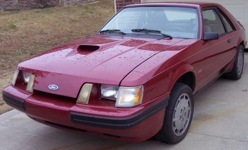 1986 was the last year for the SVO Turbo Mustang.